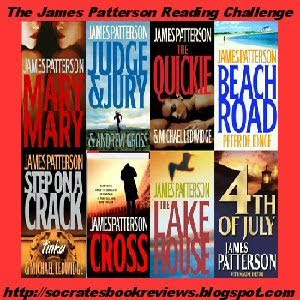 James Patterson Reading Challenge is hosted by Socrates' Book Reviews. The challenge is to read at least 10 James Patterson books in a year. You do not need to make a list of what you will read now or, if you want, you can. However, nothing is written in stone and the books you list can be changed at any time. Overlapping books with other challenges is allowed. As long as it's written by James Patterson, you can use the book in this challenge. Even if you are part of my Women's Murder Club challenge, you can overlap books and count them as part of this challenge. All books need to be read between August 15, 2009 and August 15, 2010. Books read prior to August 15th don't count for this challenge. If you want to participate, just post about it on your blog with a link back to here. Audio and Ebooks are acceptable. Please use Mr. Linky below to sign up. Use the link to your post about this challenge, not your main blog address. Links that don't go directly to your challenge post will be deleted. There will also be a Mr. Linky for reviews, although posting your reviews are not a requirement. You can take the button above and post it on your blog. I am not sure which books I will read yet because I simply believe that I have more than 10 on my TBR!!!! I will simply update this post as I read them!! Failed this challenge miserably and did not read one Patterson book at all during this time period! Best of luck on this one! I really enjoy Patterson's books! Yvonne . . . Thank you!! J. Kaye . . . I do too!! I consider them my brain candy!! Alexia561 . . . I consider Patterson to be one of my reliable authors that I can always turn to for a good (and quick) read!! I am in - I am so in and will post about this later. I am reading and listening to Patterson like crazy these days! Sheila (Bookjourney) . . . That's one thing that I like about Patterson . . . you can read a lot in such a little amount of time! They are such quick reads! Looking forward to reading your thoughts and reviews along the way!